Results for - Do you know your Miranda rights? 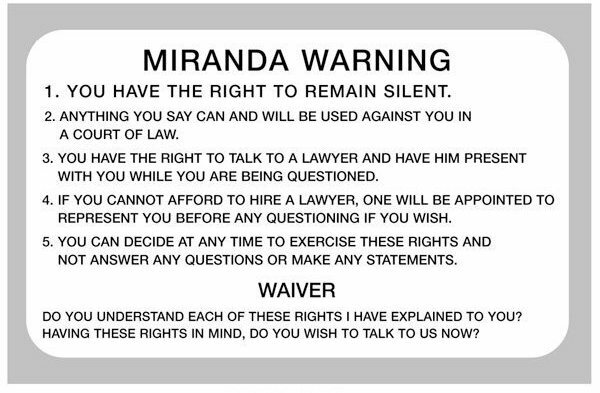 The Miranda warning, which can also be referred to as the Miranda rights, is a right to silence warning given by police in the United States to criminal suspects in police custody (or in a custodial interrogation) before they are interrogated to preserve the admissibility of their statements against them in criminal proceedings. 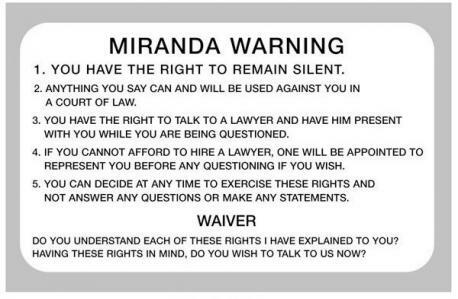 The famous Miranda rights for criminal suspects, often heard recited in movies or on TV, came from the landmark U.S. Supreme Court case of Miranda v. Arizona and are based on the Fifth Amendment. The ruling in Miranda and subsequent cases provide criminal suspects with a number of rights when being questioned by law enforcement officers. Click on the links below for in-depth information on just what the Miranda rights are, when those rights apply, plus more information on the Fifth Amendment and police questioning. 1. Do you know your Miranda rights?